A powerful tool of communication, social media allows companies to reach their customers where they are, while also characterising their brands and expanding their customer base. If correctly done, social media marketing can also increase the efficacy of other marketing techniques – including SEO and SEM – by helping build natural links, and drive traffic, awareness, brand recognition and goodwill. If you have been struggling with social media strategy, management, or advertising we can help. Social networks have been embedded into most of our lives and, increasingly, are employed within the strategies of businesses to reach a more targeted audience and increase sales. The marketing strategy of a company that does not provide proper management of social media is leaving a lot on the table for their competitors. The influence and peer interaction are achieved through social media (blogs, forums, social networking, social bookmarking and collaborative publications). However, a prudent strategy is not to focus on them exclusively. Additionally, studies have shown that social media has a 100% higher lead-to-close rate than outbound marketing, (Source: www.forbes.com) and a greater number of social media followers tends to improve trust and credibility in your brand, representing social proof. The social signals(amount of times your content is shared or liked) enhance the effectiveness of customer loyalty. Direct recommendations (such as those occurring among users of social networks) tend to be considered more reliable and honest. 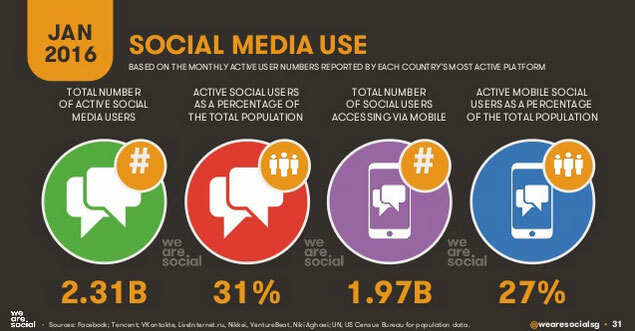 According to We Are Social, Social Media use worldwide is at an all-time high and continually growing, as we can see in the image below. Branding, creating leads, customer contact and loyalty. There are many advantages of integrating social media into a digital marketing strategy. If you want to join the prevailing trends in SEO, we can help you make the most of your social networks and platforms. We define your objectives and take advantage of the appropriate patterns to forward the interest of your brand, join existing or create communities by actively seeking fans, distribute relevant industry-based content while you concentrate on your business. We conduct an in-depth analysis of your business and your unique needs. We are a sociable bunch, and our new business comes primarily from recommendations, referrals from clients and friends who know how we work. Our social media pricing is completely bespoke and based on your current situation and your objectives.